To be honest, I was terrified of this next step. In order for the brake calipers to fit, the forward edge of the strut tip needs to be trimmed - any slight mishap here and it would mean redoing the entire gear strut, tabs, axles... the thought alone sends shivers down my spine! I should note that I went with Grove wheels and brakes (Grove 5" mags part # 57-224; ACS part #06-00870). This 'kit' comes with the wheels, brakes and torque plate. The tires, tubes, axles, spacers and castle nuts are all sold separately. For tires I went with two 500-5 Goodyears FLT 6 ply (ACS part # 06-07100) and two Goodyear PREM 5.00x5 tubes (with 90 degree stems) (ACS part # 06-05000). The drawing in the plans on page 9-1 (bottom left) is wrong - it shows the axle bolt holes in the wrong orientation. CP#30, LPC#75 gives the correct orientation as shown below. I started out by creating a template of the calipers so that I could mark the outline onto the strut. By installing the torque plate onto the axle, I was able to see where the strut tip needed to be trimmed. I used the multitool to make the first cut by trimming off the tip at about a 45 degree angle. I then used a flat metal file to fine trim the corner... I should note that I used a clamp to hold the strut down tight onto my workbench to prevent the strut from moving around while filing. The calipers are slid onto the torque plate mounting holes and are not tide down with any additional hardware. The calipers are designed to slide on these bushings to allow the pads to auto center themselves. The brake disk on the wheel is what prohibits the calipers from sliding off. 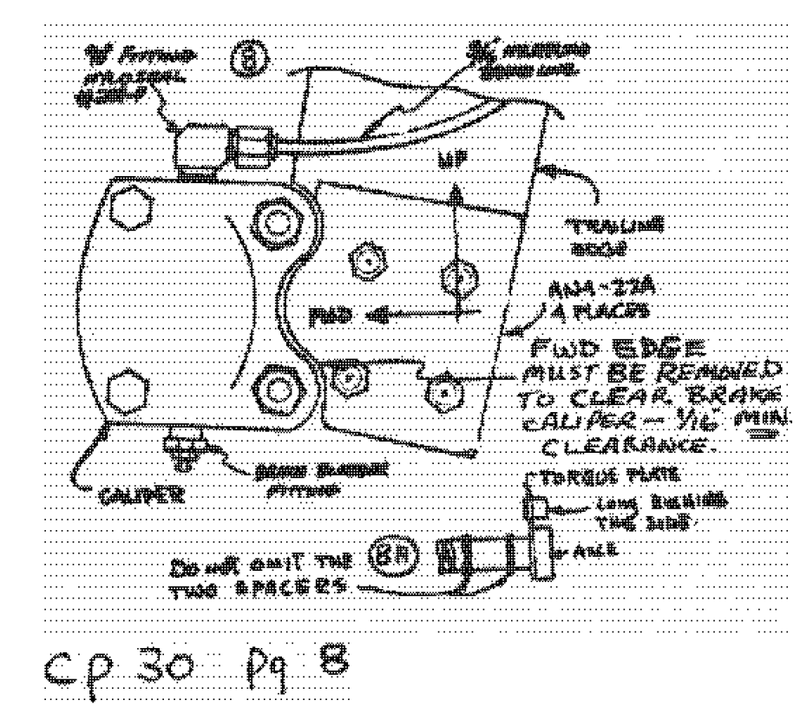 Showing the torque plate (which gets mounted on the outside of the axle) and the brake caliper. The whole trimming process was repeated on the other strut tip. With the trimming complete, it was time to bolt the axles on for good. I used four AN4-22A bolts, eight AN960-416 washers (one butting up against the bolt head and another butting up against the nut for all four bolts) and four MS21042-4 nuts. With the brake calipers installed, it was time to prep the wheels. I started out by disassembling the wheel halves and applying Aeroshell 22 grease to the bearings and a little onto the grommet where the inflate tube goes through. A little talc goes inside the wheel to allow the tube to settle into its final position. I then inserted the tube inside the tire.. making sure to align the inflate tube with the red dot. I then installed this wheel half onto the tire... again, making sure to line up the inflate tube with the red dot. I flipped the tire over and made sure the tube was out of the way so it wouldn't get pinched and ready for the other wheel half. Getting the bolts through was a bit tricky. The tire acts like a giant spring and prevents the wheel halves from mating - so it required me to press down on it - having half of the wheel overhanging from my workbench so that I can reach under it to apply the nut. Also, I had to be very careful that the inflate tube was not being pressed down into the table. Once I got one nut installed, the other two went on without a problem. I then inflated the tire to about 30 psi. The tube slowly forced the tire walls to hug the wheel rims nice and snug. The strut was reinstalled onto the fuselage. The first item to be installed onto the axle is the inside spacer (Grove part # 5710). And there she was... standing on her own two wheels!!! Besides installing the brake lines on the trailing edge of the strut, this more or less concludes Chapter 9! I'll post those pictures when I complete the work later on. You approached this task very wisely (using hand tools and small cuts). Excellent job!